The Morning Star by Robin Bridges. Volume 3 of the Katerina Trilogy. Review: Romantic, dangerous, thrilling! Robin Bridges, author of the Katerina trilogy, has finished her series with an amazing ending in the third book, The Morning Star. Katerina's secret has been revealed, but can she keep a handle over her necromancer abilities? The wrath of the Lich Tsar, Konstantin, has returned in the body of Katerina's "beloved prince", Prince Danilo. Also arriving back into town is Grand Duke, George. Unfortunately the disease comes with him, but that doesn't stop him from requesting for Katerina's hand in marriage. But accepting the Grand Duke's offer does come with a price. If she is to be wed to him she must give up her medical degree for good. Even her love for the Grand Duke cannot stop her from her medical degree, so instead they go to Paris and try to wed in secret, but Konstantin has beat them there. Capturing the Princess and taking her with him all the way to Cairo, Egypt they try to find the ancient sword, the Morning Star. Unfortunately for Katerina, to get what they want she must travel into the Graylands, the land of the dead in order to get the morning star. They are not alone in this quest; they must find the ancient sword before the Black Lily's do. The Morning Star lies beyond the seven gates to heaven, which only the most experienced mages may venture. They seek the help of a god, but a god is not what they truly summon. Instead Katerina releases, upon Mala's death, Princess Cantacuzene who will kill anyone to get the sword she had once held in battle herself. It's up to Katerina to save her beloved world before The Lich Tsar destroys it. This series is best for kids 10+. I only say this because it does get a bit gory in the end, and having a 9-year-old sister that gets scared at the sight of blood proves my point. 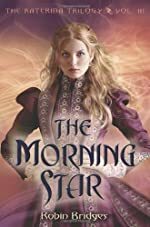 If you like the more ancient time stories then you will love The Morning Star which is filled with vampires, necromancers, mages, princesses, princes, and Lick Tsars'. Also if you are a romance seeker then this book of a tragic difficult romance winding its way through the pages will keep you interested. The tension as George and Katerina's love suffers because of the disease he got is amazing. He wishes to marry Katerina to help his pain, but she refuses, saying she will not marry him until she finds a cure for him. Overall, The Morning Star is a fantastic book. If you don't believe me go read it for yourself. Just remember, the Konstantin waits for no one. We would like to thank Random House for providing a copy of The Morning Star for this review. Have you read The Morning Star? How would you rate it?